I realized something recently: I write a whole lot about movies I haven't seen or have no intention of seeing. To remedy this situation, I'd like to take a moment to talk about a movie I will be seeing, opening night, come hell or high water. And that film is J.J. Abram's Cloverfield. Let me preface this by saying I don't watch Lost and I have no intention of ever starting. Frankly, it looks dull. I only mention this because some people seem to think that this J.J. Abrams person is fairly infallible at this stage of his career. I don't know much of anything about that, but I know he's not turning poop into gold with some sick-fetish version of the Midas Touch. Regardless, Cloverfield has made me giddy in ways that no man ever should be. Giant monster. In New York City. Destroying the Statue of Liberty. What more could a giant monster aficionado turned internet geek wish for? Oh, I've got it. How about a really cool and elaborate viral marketing campaign, complete with a maddening lack of detail. Check. How about making it to exactly one month before the movie's wide release (being today), without having your monster design leaked all over the internet yet. Big check. Much like the rest of the world, I don't know much of what the movie is actually about, but really, it doesn't matter. I've been waiting for a great monster movie for years. The Host was close. Real close. I'm hoping Cloverfield will be the one. As excited as I am for this movie, I know of at least one person who isn't too thrilled about it. I can only hope that the Big G will forgive me this indiscretion. 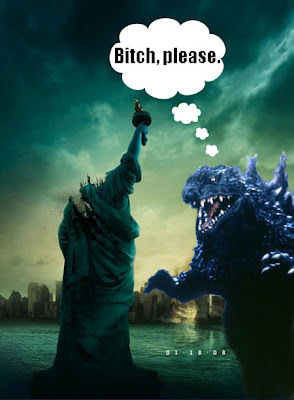 Perhaps He may take some comfort in knowing that for many months the rumorville thought Cloverfield might in fact be a new American version of Godzilla. There were other monster identity theories as well, including Voltron (Lame. Sorry. ), a Griffon, a Lion/Sphinx, and even Cthulhu. For the record, my vote was on Cthulhu. And even though it's looking doubtful at this point, that's still a movie I'd pay money to see. Are you listening, Hollywood? Giant, pissed, squid-mouthed, elder god with wings. Bring it. You know, I must say I am with you on this, and no I don't think Big G will be pissed. Moving making is at its best when it strikes a chord with audiences and I think any movie that falls anywhere remotely close to the horror/thriller/giant monster movie genera is not exception. The common bond of fear is a powerful tool. And I'm not talking your normal, run-of-the-mill scary. Would being hacked to pieces scare me? Well duh. What about being chased by some psycho? Sure. Also, as a female, anything involving walking alone at night, or being in an empty parking lot makes me want to pee myself. I'm talking about much greater fear though, one that is more universal. One that you might not even know you have. The original Dawn of the Dead gave me nightmares for weeks, while the remake merely made me jump a couple times in the theatre. Why would a bunch of sickly colored people shambling around cause me so many sleepless night? The original DotD was a social commentary. It made Americans step back and look at what they were becoming - mindless zombies. And where better to set the movie than in the heart of possibly the greatest cause of our degeneration - an American mall. Even Big G himself started as a comment on industrialization. Here he comes to destroy towns and the citizens' very way of life. Power gives him energy. His breath is radioactive, an embodiment of the post-WWII fear of all things nuclear. And America certainly has a lot to be afraid of these days. Turn to Fox News on any given day and you're bound to hear that the sky is falling. While it is funnier to point to Fox News here, the truth is all American media seems to be obsessed with scaring us out of our minds. To pick and example, whether or not you believe in global warming I think most Americans will admit to having some fears that we're perhaps not treating our planet as nicely as we should. Now bear in mind I'm not asking for Godzilla versus the Smog Monster. Lord knows that American cinema is filled with social commentaries. They're just mostly the beat-you-over-the-head-hey-who-needs-subtlety? kind. I want Godzilla. I want Dawn of the Dead. I want to watch a movie and have it be deeply unsettling on some level - and I don't necessarily even need to know why. So no, I don't think Big G is going to be upset with you. Americans need an artfully done monster movie, preferably one where the monster embodies some common fear. I want to cheer as he stomps on buildings but at the same time experience a bit of the catharsis that occurs when you see your fear and anxiety struck down by the good guys. So what do you say Hollywood? You going to give me something good this time?